Engineering discipline may go through the official website http://www.joinindiancoastguard.gov.in/ and apply for Yantrik Jobs. Application link activates from 11-02-2019 to 21-02-2019. Candidate having age limit between 18 to 22 years (Born between 1st Aug-1997 to 31st Jul-2001) are eligible for Coast Guard Yantrik Jobs. Indian Coast Guard Yantrik Jobs selection will made through written test, Physical Efficiency test followed by Medical Examination. Recruitment centres are Chennai, Mumbai, Kolkata and Noida. 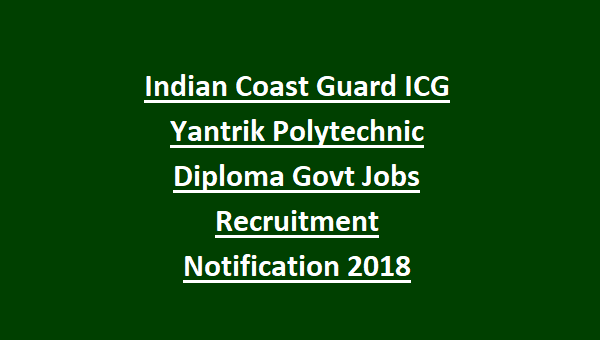 For full details regarding eligibility criteria, Selection process, Application procedure, Age limits and other information related to Indian Coast Guard Yantrik Jobs Recruitment are given below. Total Yantrik Jobs available in Indian Coast Guard Recruitment given below. Please visit Coast Guard official notification for Yantrik Jobs Pay scale details. Minimum age limit is 18 years and maximum age limit is 22 years (Born between 1st Aug-1997 to 31st Jul-2001). Age relaxations for OBC category is 03 years and SC/ ST category is 05 years. Candidate must have completed Matriculation or equivalent qualification. Diploma in Mechanical/ Electrical/ Electronics & Telecommunications (Radio/ Power) Engineering Discipline approved by AICTE with minimum 60% aggregate marks. Selection mode for Yantrik Jobs in Indian Coast Guard Recruitment will be based on written and Physical Efficiency Test and followed by Medical Exam. 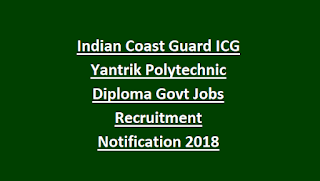 Applications for Indian Coast Guard Yantrik Posts will be accepted only through online using the ICG official website http://www.joinindiancoastguard.gov.in/. Interested Diploma Holders can submit Application forms for the post of Yantrik from 11-02-2019 to 21-02-2019 till 5.00 PM. See the Coast Guard Recruitment official website for more updates.